Preheat the oven to the temperature on the box according to your type of pan. Rinse and drain the blueberries included in the muffin mix and set aside. In a large bowl combine muffin mix, yogurt, eggs, water, and chia seeds. Gently fold in the strawberries and the rinsed and drained blueberries. Scoop a scant 1/4 cup into each liner and bake according to the directions on the box. What's better than coffee first thing in the morning? How about some fresh mixed berry chia muffins to go with that cup o' joe? Sometimes it’s just way too hard to think about prepping and cooking a huge breakfast first thing in the morning. But never fear: There’s an easy solution. 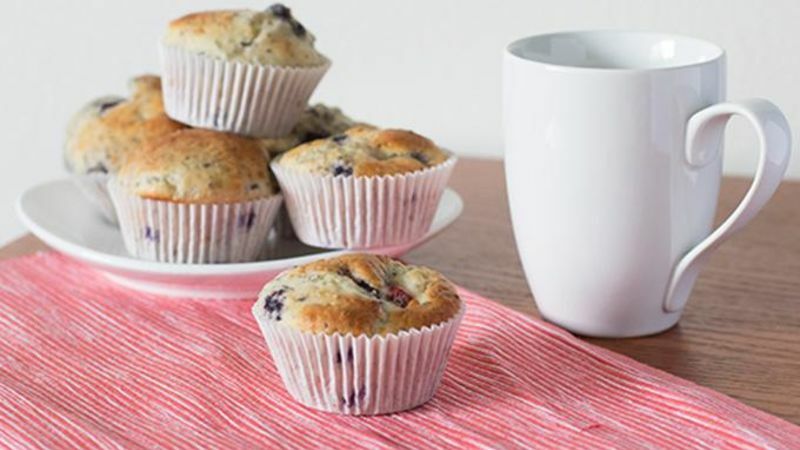 These mixed berry chia muffins are not only simple to make, but they’re super tasty. Plus, they have chia seeds – and as we all know chia seeds are the new it thing. So obviously we need to put them into a muffin with Greek yogurt and summer strawberries for a quick breakfast treat! We make this easy by starting out with Betty Crocker Wild Blueberry Muffin mix and adding eggs, Yoplait Greek 100 Vanilla Yogurt, fresh strawberries and chia seeds. The first step is to drain and rinse the real blueberries. (They’re in my sink while we mix the rest.) Then, in a large bowl we’re gonna mix the muffin mix, Greek yogurt, eggs, chia seeds, and some water. After everything is combined we carefully fold in the berries so they don’t bleed too much in the mix. Next we line a cupcake pan with liners, fill with a scant quarter cup of batter and bake until golden brown. BOOM. Easy breakfast. And perfect with that morning cup of coffee or tea!